We are so proud of the customers that have constructed dog houses using our law enforcement dog house plans that we want to show our appreciation and recognition of a job well done. 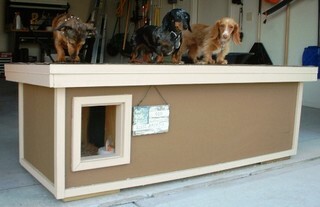 Many of these customers have been first time builders, and they have succeeded in building their pets a beautiful dog house using our easy to follow step by step law enforcement dog house plans. Their pets now have the best, structurally sound dog house available, along with the comforts of this durable house in all weather conditions. This will be the last dog house these people will have to build due to the great design, and durability of these unique police dog house plans. We are so pleased with the accomplishments of these customers, that we would like to be able to help them show off their building endeavors, and their beautiful pets to their friends and acquaintances by posting their picture of their completed house with their dog or dogs that they have emailed us . When you have completed building your dog house using our law enforcement dog hose plans, make sure to email us a picture, that we will post to our customer sites and show the world your wonderful pets with their beautiful new dog house.